As I expected, getting regular updates on the hobby front is not that easy. :) Time tends to fly quickly and not every evening can be dedicated to the hobby. It does sound like a lame excuse but fortunately I did something last week, so it is not too bad! I continued with the drakons of course. But this time I wanted to catch up with some progress on the riders. I had them assembled but since I combined Cold One Knights legs with Dragon Princes torsos, some green stuff action was required. I also had a look how drakons fit onto their bases. I have seen that problem on the pictures of other players, they either position only two models on the outer edges or do it vertically, by mounting the fliers on rods. I haven't made my decision yet. 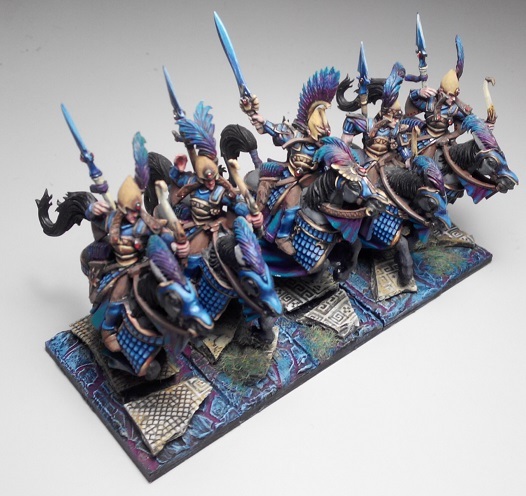 Two drakons for a regiment look good but I wanted to have them all there. I am just concerned that if I place them on some kind of rods they will be significantly higher than the rest of the models. But who knows, it may actually create a very nice visual effect! In addition, such arrangements may help in games where units need to be positioned base to base. I also continued with my experiments for bases. As described earlier, I used super sculpey first to create ancient Greek mosaic and then broke it into pieces. Next, I created frozen layer on all bases and pressed broken but already cured pieces into place. Two layers are still visibly separated but I think the effect is better. I also added some sand here and there and a few spots are covered with static grass. In terms of painting I used lighter colors to finish each layer so that the contrast is better. 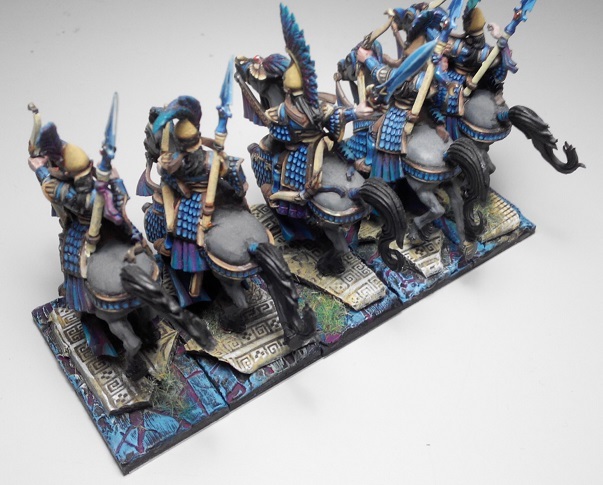 I like the effect in general, I think it will look nice with all the units and I am finally getting to the point where bases will unify the look of the army further. Quick snapshot of the finished bases for Drakon Riders regiment. I corrected the bases for Silver Breeze unit so that they look similar too. I really like these rolling pins and I have noticed that the provider keeps adding more and more patterns! Hopefully I will have a new unit to add too! Looking good Swordmaster, keep it up! Time organisation is very tricky at time. I currently have 8 battle reports currently awaiting write up, I really need to get started on them. Time management is always tricky! :) But I will keep trying to find a way that is more efficient. Simply to be able to finish these projects I keep postponing forever! 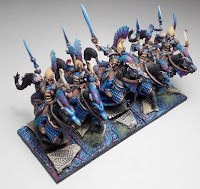 Those bases look fantastic on them, I like the blue.